WHEN ALIENS INVADE, ONLY A CON MAN CAN SAVE THE DAY. Hollis Palmer is not a good man. An unapologetic thief and womanizer, he has no time for anything that won’t profit him directly. So while the rest of the world is staring up in shock as aliens race toward Earth, Hollis is busy stealing a case valuable enough that he’ll be able to ride out any invasion in style. But ET's arrival proves to be a bigger catastrophe than Hollis – or humanity – expected. Meanwhile, his would-be hostage, Mia Davies, the trophy wife of his criminal boss, is making the aliens look like a walk in the park. As their plans crumble along with the rest of the world, Hollis and Mia find themselves on the run from a motley crew of aliens, criminals, and crackpots. The two of them must figure out a way to work together without killing each other before something really bad happens–like the city gets blown up, for example. 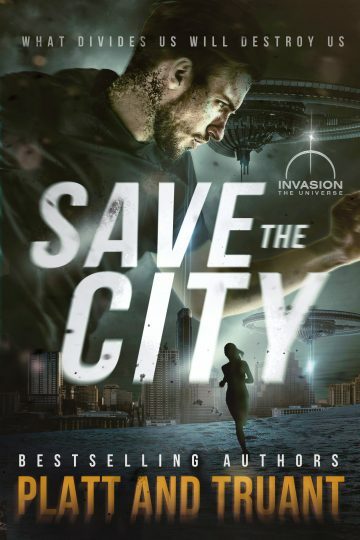 The first book in Platt & Truant’s new series set in their bestselling Invasion Universe, Save the City is a relentless, action-packed tale of alien apocalypse that will leave you breathless – and ready for more.